It is my deep conviction that much of American evangelicalism needs a better view. So-called “biblical worldview” and “Christian worldview” often denote a political ideology that largely or completely ignores the life and teachings of Jesus. Taking a step back to examine this evolution of Christ-free Christianity is striking. In most of these cases, Jesus is regarded as Savior but not as Lord. His call to “Follow me” is largely ignored in favor of a fear-based, discriminatory “faith” at odds with much of what Jesus said and did. This awareness has led to the emergence of the Jesus Worldview Initiative being coordinated by Nurturing Faith. For more than a year we have talked and listened, written and gathered, explored and affirmed what it might mean to more effectively respond to that which Jesus himself deemed the greatest commandment: to love God and neighbor. We are now developing a comprehensive proposal to envision and provide a variety of published and experiential resources to nurture a congregational culture in which the highest priority is to follow Jesus. The support and collaboration that follow will determine the scale of this much-needed initiative. A Jesus worldview offers a better view for those who claim to be his followers. We also want to engage those who feel alienated from congregational life but not from Jesus. Sometimes a better view helps reveal a better worldview. 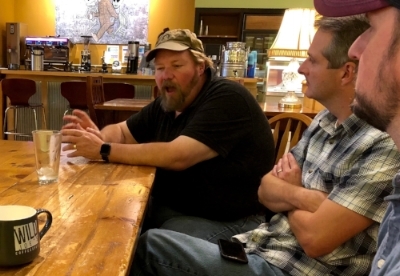 So turning to Nurturing Faith’s valued resources in the West, we held a second Jesus Worldview retreat in West Yellowstone, Mont., last week to engage more pastors in this exploration. Clearly, meeting in such a setting clears the mind and inspires creativity in ways a conference room cannot. My colleague Bruce Gourley, who lives in Bozeman, Mont., and I were joined by pastors Jonathan Barlow of First Baptist Church of Dalton, Ga.; Mike Gregg of Royal Lane Baptist Church in Dallas, Texas; Jeff Mathis of First Baptist Church of Sylva, N.C., Benny McCracken of First Baptist Church of West Yellowstone; and Matt Sapp of Central Baptist Church in Newnan, Ga.
Also, Fr. Jon Davis of Oviedo, Fla., an Episcopal priest and church planter affiliated with Fresh Expressions, joined us in this exploration. Spacious skies and majesty give a needed perspective on life’s priorities and the calling to live and lead in ways uncluttered by all that distract from the primary focus on following Jesus. Our prayer and hope is that the result of this and other preparations will lead to published resources, personal engagements and inspiring experiences that help shape a congregational culture in which divisive politics and distracting doctrinal debates give way to a reinvigorated commitment to the ancient confession that Jesus is Lord. Indeed a Jesus worldview is a better view.